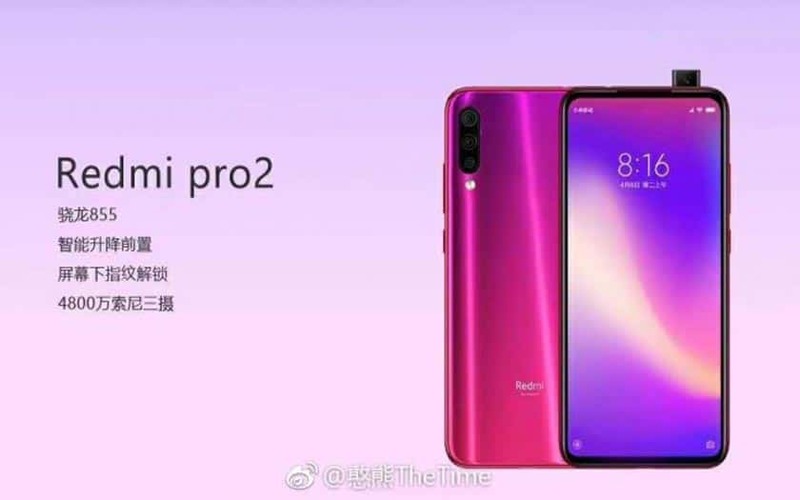 The Redmi Pro 2 is leaked, and what we know only bodes well. The smartphone would be oriented upscale with a SoC Snapdragon 855, a retractable photo sensor and a fingerprint reader under the screen. Is Xiaomi ready to launch a mobile with an incredible price-performance ratio as with the Pocophone F1? We reported to you early in 2019 that Xiaomi was planning to launch a Redmi smartphone equipped with a Snapdragon 855 . And the information seems to be confirmed via a new leak on the Chinese social network Weibo, this time with a visual of the smartphone with some information. Called Redmi Pro 2, the mobile phone would indeed be the last SoC high-end Qualcomm. With the Redmi Pro 2, Xiaomi tries a blow to the Pocophone F1? But that’s not all. The smartphone would also be entitled to a retractable photo sensor, also called camera pop-up, Vivo Nex. We note the absence of fingerprint reader at the back, which joins a report on the launch of a Redmi with fingerprint sensor under the screen . Also mentioned is the presence of a main photo sensor of 48 MP. So many features rather unexpected on a Redmi. But what was a range of Xiaomi has become a brand in itself, a bit like Honor for Huawei or Poco for Xiaomi already. After the success of the Pocophone F1, we can also wonder if the Chinese group does not try a similar strategy by offering a smartphone as well equipped as the high end for some features but at a much lower price. The Pocophone F1 was the most affordable Snapdragon 845 camera on the market, for example. To be clear, we will have to wait to know the price of this Redmi Pro 2. Will it hit as hard as the first mobile Poco? The Galaxy F would officially be called Galaxy Fold, surprise!